My colleague Martha Henson and I ran a mini-workshop at this year’s Museums and the Web conference in Philadelphia. The workshop consisted partly of a summary presentation of some of our experimentation and evaluation with games at Wellcome Collection, but mostly of a workshop in which we asked people to brainstorm ideas for new museum games. The aim was to share ideas, experience and knowledge with the (very knowledgeable and experienced) people in the room, and also to validate one of the principles on which we’ve been working: that bringing a museum theme directly together with an established method of gameplay, rather than working backwards from educational or narrative objectives, generates good ideas for engaging games. The workshop seemed to be a success to us: A room of 60-70 people spent an hour taking and thinking, and came up with some great ideas for games. So we thought it might be worth publishing the format and materials, in case anyone else finds them useful. 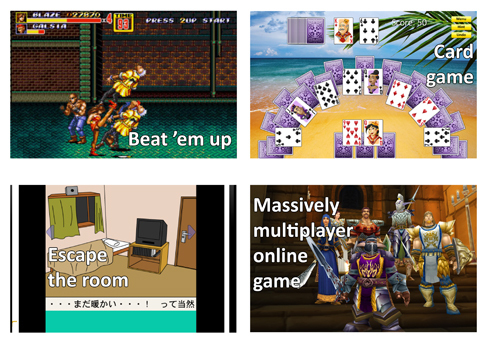 We assigned them two or three ‘game type’ cards, with the name and image of a type of game (First Person Shooter, Beat ’em up, etc) one side and a brief Wikipedia definition of the game on the other. We asked each group to think of a collection, aspect of mission of their cultural heritage institution, and then to bring that together as the basis for a game, then to spend 15 minutes brainstorming and fleshing out that game. The cards we used can be downloaded here as a PDF. They’re A6, printed on A4, so each sheet contains four cards and need to be chopped. They’re two-sided, so if you print the PDF back-to-back, the image and description will come out on opposite sides of the same card. We’d be very interested in feedback if anyone uses them for a similar exercise. This is an opinion piece co-written by me and Martha Henson published today in Wellcome News (a publication whose audience is based in scientific research rather than museums). It’s a little bit provocative…. Do you play games? We might dismiss them as childish, but in his 1938 work Homo Ludens, Johan Huizinga argued that play is an essential component of all human culture. The chances are that you enjoy playing something – whether it’s Angry Birds or a round of charades at Christmas. Globally, gaming is big business, with a market worth an estimated $50 billion (£30bn) in 2011 and a demographically diverse audience with an even gender split. But it’s not just about numbers: the dedication of gamers to the pleasure of play means time spent at the console can exceed that spent with a feature film or novel. The educational potential seems obvious. So why have museums and educationalists, with all the information and resources at their disposal, failed to make more than a handful of really compelling educational games? The work of game designers and researchers such as Jane McGonigal (author of Reality is Broken) and Channel 4 Education (including the Wellcome Trust-funded Routes) has amply demonstrated the power of games to bring both children and adults cultural and scientific ideas in new forms. But many have assumed that any game-like feature is enough to engage people, and tacking minimal interactivity onto a barely disguised didactic lesson plan has unfortunately been the dismal standard in this field. However, others, such as the Science Museum, have begun to harness the potential of games for learning. The physics-based Launchball game was hugely popular and they have just released Rizk (about climate change). 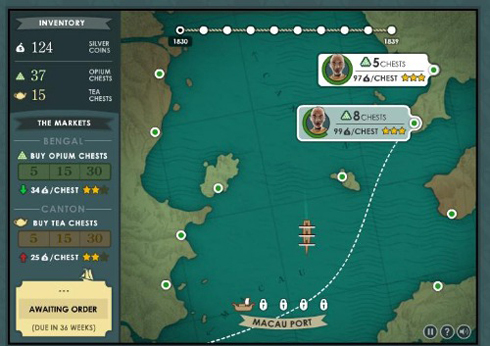 We’ve had our own success recently with High Tea, a strategy game centred on the dubious actions of the British Empire in the run-up to the Opium Wars of 1839. From over 1.5m plays in its first fortnight after release, plus comments, reviews and survey responses, we can see that we have achieved both a wide reach and our educational aims. Why are these particular games successful? Because they put gameplay at the centre of the experience and use experienced digital agencies to deliver this. These examples are a great start, but surely more could be done in this area. Games might seem a trivial way of approaching the public with new ideas, but the playful and exploratory impulses that draw gamers to great games are still largely untapped as a means of engagement. By pushing boundaries ourselves, we hope to show others what can be achieved.